MTHFR gene mutations are complicated and certainly just the tip of the iceberg. With each day that passes I think most of us realize that for as much as we know about genetics and health, we really know very little. There are so many pathways in the body and so many more biochemical processes at play than just methylation. I know that every day I learn something new, something that makes me question whether I am on the right health path, whether there is something I’m overlooking and who the doctors are out there that truly get how all of it works and how to heal us. I will write more about this in the future but for now I hope that awareness of today’s topic will bring forward another piece of the puzzle for some of you. Fermented foods are one of the hot health trends at the moment among natural food authors and some health practitioners. But did you know that some people cannot tolerate them? 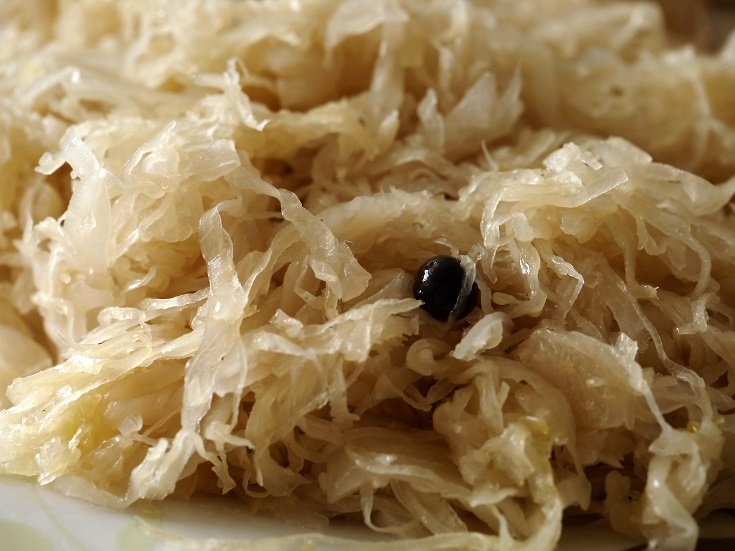 In fact, fermented foods make some people very ill. This is because of the high histamines they release. For many of the people who cannot tolerate them, conditions called mast cell activation disorder/disease (MCAD) and mastocytosis also cause a number of other symptoms. Mast cells are part of our immune system and within them are granules that contain inflammation-causing chemicals. We generally need these for healing wounds, forming new blood vessels, remodeling tissues and to defend against pathogens. Their role in the allergic response is the way most of us are familiar with them as histamine is one of the chemicals found in mast cells. Mast cells are innate immune cells that play a role in defending the body against bacteria, viruses, and parasites, but are best known for their participation in the allergic response. When mast cells degranulate, or burst open, histamine and other chemicals are released, leading to symptoms which we associate with allergies, including having a runny nose, wheezing, hives, etc. Most of us are familiar with the antihistamine drugs that are used to treat allergic symptoms, such as Claritin, Allegra, and [Zyrtec]. Although these medications do not prevent mast cells from releasing histamine, they prevent symptoms by blocking histamine receptors. While once thought rare, these disorders are actually on the rise. Symptoms can occur in virtually every organ and tissue yet MCAD is difficult to determine and diagnose. Here you’ll find a list of tests you can ask your doctor for, including serum histamine and serum tryptase as a starting point. As avoidance of triggers is a major part of treatment, one may troubleshoot whether mast cells are at play based on those as well. Common triggers include insect stings, high histamine or histamine-releasing food and beverages, exercise, perfumes, chemicals, gas fumes, exercise, extreme temperatures, certain medications, stress and pollen. MTHFR polymorphism may be a predisposing factor to mast cell disease. 5-MTHF regulates biosynthesis of BH4. The A1298 mutation in the MTHFR enzyme [affects] the conversion of BH2 to BH4. Less amounts of BH4 inhibits NO formation resulting in increased mast cell degranulation. Inadequate BH4 formation also puts a strain on the conversion of tryptophan to serotonin and tyrosine to dopamine, leading to low levels of the neurotransmitters: dopamine, norepinephrine, serotonin and melatonin. Another consideration is the fact that methylation clears excess histamine from the bloodstream. So undermethylators may be more sensitive to histamines. There is a large body of research linking MCAD, mastocytosis and histamine intolerance to a variety of chronic conditions, including autism, irritable bowel syndrome (IBS), atopic dermatitis, migraines, asthma, arthritis and eczema. So this becomes another piece of the puzzle for those looking to treat or cure these illnesses. This brings me back to high histamine foods and their avoidance. A frequently asked question in MTHFR circles is: what is the best diet for people with MTHFR? The answer is that it’s impossible to answer that question. Each person with MTHFR also has unique aspects of his or her biochemistry that make his or her case different from everyone else with MTHFR. There can be no MTHFR protocol or diet. There are some things that everyone can agree on, like folic acid being detrimental, but then all the other factors of a person’s health and physiology come into play and that makes it difficult to address one gene mutation unilaterally. So far this blog has focused on MTHFR exclusively but over the course of this year I plan to bring in more information about other crucial gene mutations and health conditions that will hopefully assist people in assessing their own situations a bit better. MTHFR is just one part of the overall picture. I have compound heterozygous MTHFR, for example, and have never noticed a reaction to fermented and other high histamine foods. That doesn’t mean that I don’t have any problems with mast cells, but my histamine levels aren’t high and I don’t have severe reactions at this time. That can change with age. But those people who do notice either a reaction or a significant symptom from the list may want to consider this disorder and troubleshoot with their doctors. Mast cells can store the histamine from these foods and release it later on, over time damaging nerves. In this instance, mast cells and MTHFR are connected and those people should avoid fermented foods and a high histamine diet. Fermented foods also raise glutamate (also found in processed food) acting as a neuro-excitotoxin and spelling trouble, especially for those with migraines, epilepsy, bipolar and related disorders. Certain probiotics may also aggravate MCAD so this is something else to be aware of when working on your gut issues. As an important side note, mast cells play a big role in allergies, so if this is a problem for you or a loved one, check out this article from AllergicChild.com. I recommend this guide from Full Circle Integrated Health for dealing with histamine intolerance. Posted by Andrea & filed under Health Conditions. This post has 42 comments. What about Singulair with these patients? I just found out that I have 2 heterozygous MTHFR mutations (C677T and A1298C). I have Interstitial Cystitis and have been taking the Singulair with good results. That drug has some known negative side effects for some people. I actually tried it for chronic hives at the end of last year and had to stop because of the side effects. But thanks for suggesting it – might be an option for some people; just didn’t work out for me. And I don’t know whether it is indicated for MCAD. I was looking for the research on it because it is a mast cell inhibitor. I have frequent urticaria/hives (without the singulair). It is currently indicated for asthma and bronchospasmsms as well as allergies. Concerning with MTHFR follow Dr. Ben Lynch ‘s theories and medical recommandations. He is the best informed person about this subject. Amy Yasko wrote a book about Nutrigenomics. It is worth reading , but someone aspects are to handle with care! Starting the pathway to healing because of your information and training of my DOctober found from your site Dr. Peter Kan, Gilbert AZ. Histamine, allergic to b vitamin, gluten intolerance, peanut, egg whites, lactose, pesticides and inability to detox medication. Multiple surgeries for injuries, ex rays taking out my thyroid, causing radiation poisoning and other conic infections, leaky gut, leaky brain and brain injuries from a fall and adrenal failure. I thank God for you and your care to get people well. One step at a time facing one day at a time to healing of mind and body. We need more doctors that do not piece meal symptoms was my biggest issue. They just wanted to say it was panic attacks from the brain injuries. Now thanks to 23 and me, complete labs and an informed doctor who doesn’t just poopoo all these symptoms and reactions I am starting to laugh again and look forward to the days of healing ahead. Never give up and keep your faith, it gets better. Asking for a friend. Have you been diagnosed with Mast Cell Activation Syndrome? And is Dr. Peter Kan still your treating physician for this disorder. What kind of specialty does he practice? Have a friend in Arizona who cannot find any physician to help her with Mast Cell Activation and she is very fragile. Sensitive to everything, foods, med’s, sound, light, etc… She is losing a lot of weight too. Any suggestions would be great. Blessings. Hi Heather, don’t give up. I am having to heal stress adrenal fatigue, gut parasite, thyroid, brain. Went through 8 months with Dr kan in Gilbert az. Got .e on the right path. Stopped eating night shades, started nutritional iv therapy with Dr gowey in Flagstaff az with dna/rna repair. She treats only with dna results. She will work with you and willing doctor. I have recently got hit hard with POTS, which very well be because of some Mast Cell Disorder in the last month or so. I may or may not have had histamine issues in the past, but this seemed to come out of nowhere. We are not yet sure if I have some Mast Cell Disoder, but it is highly suspected, for doctors move so slow when it comes to healthcare anymore. My skin gets flushed and I get temporary rashes on a daily basis. If I scratch, the skin that I scratched turns beat red. I also developed hypohidrosis, where I do not sweat like I should. Whatever this is, it has done a number on me. I am looking for advice on how to navigate this. What doctors to see? So far neurologist and endocrinologist. I want an expert in Mast cells, someone to safely put me on meds to control the histamine and nerve damage, well as well as the POTS. Does anyone know of one in the Philadelphia area? I am also afraid of having an emergency and dealing with an ER that does not know how to deal with mast cell disorders. For instance, beta blockers can be dangerous to me. Morphine, and aspirin can be very dangerous also. How does one navigate such issues. POTS is a cardiac issue, and it is reasonable to be fearful that some sort of emergency can come along. Are you currently taking magnesium chloride? It is good to take magnesium chloride because it can help with any mutations and help the system work better. It also lowers the electrical firing of cells, and thus calms them down. Calcium raises the electrical firing of cells and thus makes cells more reactive. So I would suggest getting educated on magnesium (read The Magnesium Miracle by Dr. Carolyn Dean and/or watch her youtube videos) and you could start taking a well absorbed magnesium chloride like Trace Minerals Research “Mega Mag” ionic liquid magnesium chloride (start w/ 1 dropperfull/day and gradually work up to 2 dropperfulls in AM and 2 dropperfulls in PM). Also, I would stop taking any calcium supplements or multivites because they also have calcium in them. Calcium overexcites nerves and magnesium calms them down. Another good book to read is “The Calcium Lie: What Your Doctor Doesn’t Know Could Kill You” by Dr. Robert Thompson. Everyone has a different case of course and there could always be cardiac factors in addition to POTS, but POTS isn’t truly a “cardiac” condition. It’s an autonomic dysfunction which means that the mechanism in your body that “sends” the signals to your heart (to beat faster or slower) or to your blood vessels (to constrict or dilate) are faulty. The autonomic nervous system regulates everything in your body and has sympathetic and parasympathetic branches. They both work together in regulating all the functions in your body. That’s why many of us POTsies not only have cardiac-related symptoms, but also can have many other symptoms that initially seem unrelated, like severe nausea amongst other things. Be aware also that mast cell reactions can worsen your POTS symptoms significantly! I was placed on medications for POTS, but still found myself having horrible symptoms especially after meals and was then diagnosed with MCAD. Eliminating those foods from my diet helped me with my symptoms. I am currently taking a beta-blocker for POTS, and I believe that most/many POTsies take them. So don’t be afraid of them unless you have a known reaction to them, and I’m sure there are always different formulations you can discuss with your doctor. In terms of morphine and aspirin, you can look into medical ID bracelets that can be worn to list these important informations. For me, being diagnosed with POTS was a relief after half a year of horrible symptoms, but my MCAD diagnosis scared me! But, I have been able to find a new sense of “normal” for myself and one thing that has really helped me is doing the most to educate myself about what is going on in my body so I know what to expect. Did anyone respond to you on this? We tried it and it worked for some of our true allergies, but not for our daughter who has mast cell activation disorder. Oh no….i have been on the GAPS diet and I know I have histamine problems. when I tried the fermented food through I was going to die. But I forgot I have been taking the fermented cod liver oil……AHHHHHH!!!!! That could be what is getting to me too. What should I substitute for it regular cod liver oil, fish oil, or are all oils basically rancid in the container anyway. Help I am miserable. I made that mistake before I was correctly diagnosed with MCAD. My allergist thought I was allergic to Beef and Pork. When I took a fish oil capsule I decided not to consume the outside of the capsule because it contained Gelatin so I cut off the top and drank the fish oil! That’s when all hell broke loose! I take the probiotic Prescript-Assist. Is that a bad one if I have mast cell issues? Stay away from fermented, aged, smoked, citrus, processed and leftovers. Get dr lynchso pretty and probiotic formula for histamine suffers. I would suggest quercetin with bromelain and super forkskohlii to start. Watch folic, soy, gluten, dairy. I have gone to coconut milk. It gets better. My issue is what I believe to be leaky gut. If fermented foods heal the gut, what do I do in the case with histamine issues? I had a colonoscopy a few years back and they told me I had mast cells in the lower colon, recently I had another scope and it came back negative. Urgh. I don’t know what to do. I just want to heal my gut and start feeling myself again. Any suggestions? There are some tests for mast cell diseases – try a search on “blood test for mast cell disease” but I’m not sure if any are MCAD specific. You’d want to speak to a doctor who works with these problems. Andrea what doctors work with these problems? I have Hashimoto’s Autoimmune and Fibromyalgia, and I suspect methylation and histamine intolerance. Diane, please find some doctor databases here – if you scroll down to just before the comments section on that post you will see some links under “Holistic-Minded Physician Associations who think outside of the mainstream ‘treat the symptom’ paradigm” – try looking within these first. Good luck! I’d suggest seeking care by a naturopathic doctor (ND). NDs are nationally board-certified primary care physicians trained to diagnose and treat disease. NDs use a wide variety of treatment options including diet, herbs, nutritional supplementation, homeopathy, physical medicine, and, if need be, pharmaceuticals (if under your state’s Scope of Practice). Check out naturopathic.org to learn more about naturopathic medicine and to find a ND in your area. Check out Dr. Afrin or Dr. Dworski for your mast cell concerns. One is in Minnesota and the other at Nashville, TN. Hope this helps. And there are test to check for MCAD. You need to be having a flare then take a 24 hour urine collection that will be checked for methyl-histamine. That is just a start. Both these doctors are wise and will help you get started. Thank you for posting this. My two year old son was just diagnosed with this. We are just awaiting test results to see if it is internal as well as external (rash). I have read that people with this should carry an epipen due to increased chances of a bad reaction to bee stings…..do you know any more about this? Also – do you know which medicines to avoid? I am fairly certain my son had a bad reaction to ear drops with a anesthetic. I am mthfr c667 ++ so my son has at least at hetero mutation. My dad is fairly certain he had this as a child….I also heard that SAMe and Amy Yasko’s RNAs can be helpful. Hi Amber – I don’t have any lists of medicines or know about the epipen, sorry. What does your doctor say? I was told that I must carry an Epi pen at all times due to the episodes of Anaphylaxis I’ve had. If your son had episodes of anaphylaxis, most likely he’d need to carry an epi pen. This is especially true if he’s allergic to bee/wasp stings like I am. Ask your dr.
Have you looked in to the relationship between mast cell de-granulation and exposure to microwave radiation–the emissions used by all of the wifi equipment being sold today, from cell phones to laptops, to I-phones, to “wireless” office networks? No, I haven’t. Do you have some information you’d like to share on that relationship? I have horrible issues with histamine, and I am compound heterozygous. I get palpitations all the time after I eat, and I don’t eat that many fermented foods. I also have trouble with allergies. This was an interesting article that I am taking to my holistic cardiologist. He says there is a link between MVP (mitral valve prolapse) which I also have, and histamine issues. “The A1298 mutation in the MTHFR enzyme [affects] the conversion of BH2 to BH4.” This is not true. The MTHFR enzyme does not participate in the BH4 cycle at all. This is a misconception begun by Amy Yasko probably because it looked really cool to have all those cycles connected on her methylation cycle map. Thanks for sharing this info, Rochelle. Do you have a reference for your information? Amy Yasko would do that?? If this is true how can we trust other information she proclaims? Actually makes me wonder what is actually fact and what is actually fiction in this whole MTHFR “movement”…especially since I’ve already spent over $500 on pursuing my genetic mutations recently! Rochelle, how do you know the MTHFR enzyme does not participate in the BH4 cycle? Reason I ask this is because I am working with a doctor who specializes in chronic illness. My 23andme genetic results were interpreted by geneticgenie and then sent to him. He recommends a BH4 supplement that costs $60 to boost the A1298 methylation mutation, meaning I guess that that’s exactly what he want to do, is help create more BH4. I clicked on the boxes here saying to notify me of follow-up comments, so I will get them if you respond. YES yes yes – I have the same, thank u 4 this.